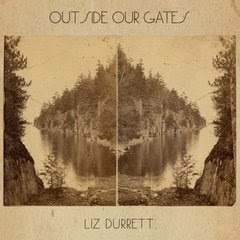 We are only just beginning to digest Southern gothic songstress Liz Durrett's forthcoming full length Outside Our Gates. One thing made an immediate impact, however: the similarity between the cut "All Of Them All" and "I Can't Breathe," an astounding and affecting instrumental situated deep within Barry Black's 1995 self-titled set. And there is a connection. Barry Black, in the event you did not know, was a relatively short-lived project of then-Archers Of Loaf fronter Eric Bachmann, he who currently toils under the moniker Crooked Fingers and his given name. Mr. Bachmann, it turns out, produced and arranged Ms. Durrett's Outside The Gates, which will be released by Warm Electronic Recordings Sept. 9, and we have to believe it was his influence that is manifested in the guitar clangs that loop in the background of "All Of Them All" (a similar device can be heard in the knock-out Crooked Fingers jam "The Rotting Strip," now that we think on it a moment). Durrett's bright strummer with soulful strings is a clear standout among the 11 tunes that populate her new set, which was recorded in the spring of this year in Athens, GA (you can see some pictures from the session at Durrett's web site here). We first encountered Durrett's work in 2005 when Warm issued her collection Husk, which we reviewed here for Junkmedia's World Of Sound blog; Durrett released The Mezzanine in early 2006 and we really thought we reviewed it -- but we can't find any evidence to back up our assertion. Nevertheless, her strong, chalky alto voice makes a strong impression. Bachmann also has a new record in the works: Crooked Fingers will issue Forfeit/Fortune Oct. 6 without the assistance of a record label.